Welcome to Heaven’s Window in Pigeon Forge! This amazing 5 bedroom, 5 bath cabin rental has all of the comforts and amenities to make for an unforgettable Smoky Mountain vacation getaway! Enter into this gorgeous cabin and step into total luxury! The spacious and inviting floor plan will definitely make you feel right at home. The living room boasts plush leather furnishings, cozy fireplace, deck access, and a flat screen TV. Located near the living room you will find the gourmet kitchen with stainless appliances, granite counter tops, custom cabinetry, and all of the utensils and cookware to prepare your favorite meals while vacationing in the Smokies. On the main level of Heaven’s Window is the first of two luxurious king suite bedrooms. Here you’re treated to a flat screen TV, private deck access, an en-suite full bath with jetted tub and a walk-in shower with a rainfall shower head. 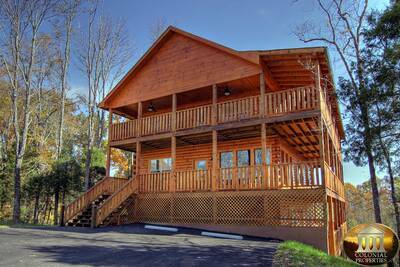 Additionally, on the main level of this Pigeon Forge cabin rental is a second king suite bedroom with flat screen TV, private full en-suite bath, and deck access. Head down to the lower level and you’ll find more amazing features and amenities. On this level is the second master suite bedroom with flat screen TV, private deck access, an en-suite full bath with jetted tub, and a walk-in shower with a rainfall shower head. Venture down the hallway and you will find the children’s bunk room with flat screen TV and convenient access to the adjoining full bath. Here at Heaven’s Window you’ll have your very own in-cabin home theater with movie seating and surround sound. This is the perfect place to watch your favorite movie, TV show, or sporting event on the big screen! Also, if you’re looking for a little fun and excitement, there’s a shuffleboard table and an arcade game featuring over 50 of the most popular arcade games of all time. Located nearby is a king suite bedroom with an en-suite full bath, flat screen TV, and private deck access. 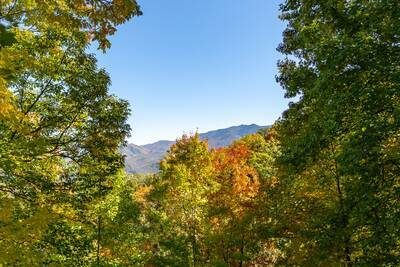 Heaven’s Window offers you and your guests breathtaking outdoor space to enjoy the amazing Smoky Mountain views. Soak in the bubbling outdoor hot tub and gaze out into the beautiful mountain scenery. 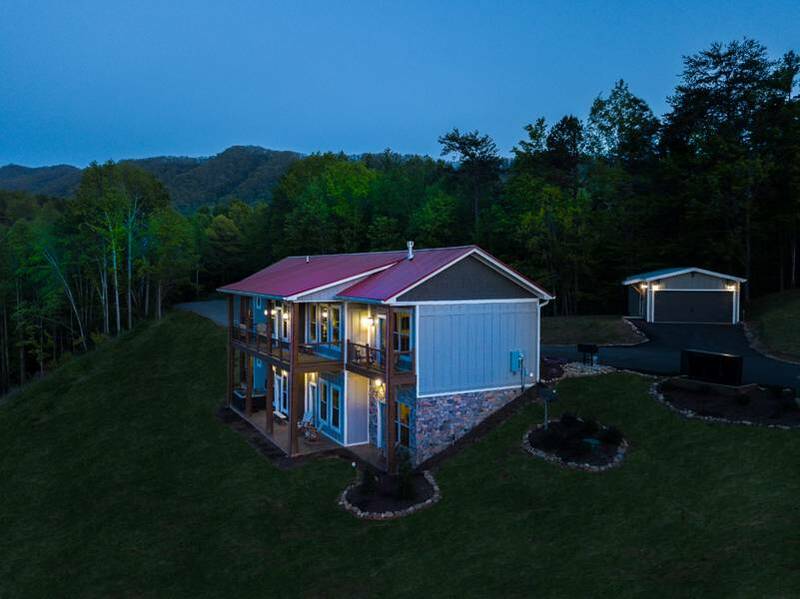 This Pigeon Forge luxury cabin provides you and your guests with complimentary high speed WiFi internet, so be sure to pack along your laptop or tablet so you can browse the web or check your email while vacation here. With its countless amenities, strict attention to detail, luxurious features, and stunning mountain views, your time at Heaven’s Window will be something that you will forever cherish. Plan your vacation getaway here today! The Summit of Locust Ridge is an exclusive community located in the foothills of the Smokies with majestic views of the Smoky Mountains. Quality craftsmanship and strict attention to detail ensure that your stay at The Summit of Locust Ridge will be one that you will forever cherish and remember. To learn more about this amazing vacation destination, CLICK HERE. A: Approximately 25-30 minutes to the main entrance - depending on traffic. A: Hi Danielle! Heavens Window is approximately 20 minutes to Downtown Pigeon Forge. A: Hi Nate, this beautiful property has 4 King Beds, 2 Full Bunk Beds, and 2 Sleeper Sofas. “ We absolutely loved this cabin, plenty of room for all six of us. We loved the kitchen and spent lots of time cooking there. The theater room was amazing, we watched plenty of movies for our family movie night. The view from this cabin is beautiful, we will definitely be back again. “ We had a wonderful weekend in your beautiful house. We had a total of ten people staying here and we were very comfortable, we all loved the theater room, and shuffle board game. The hot tub was also a big hit, the scenery from the back deck is amazing. we also loved having the Christmas tree and decorations!!! “ A great weekend of meeting new friends and having a wonderful time. The cabin was beautiful, cozy, and relaxing. My wife and I can't wait until we come back, we look forward to returning. “ Beautiful accommodations, scenery, and fellowship among family and friends. In this day and age, it's nearly impossible to get everyone together although some weren't able to come, many were, and memories were made that will hopefully last a lifetime. “ We had a wonderful family girls trip, the view was amazing and we enjoyed reading about the history. The children loved the theater room, and the mountain view. We can't wait to be back to create more memories. “ The house was epic. The Pacman game was cool. The theater was sick, my friends and I loved it!! Loved the cabin hope to see it next time. Cool House! “ We spent a lovely weekend here celebrating our fathers 80th birthday. We've come from Georgia, South Carolina, Utah, and Nebraska. The weather was perfect, and this cabin was gorgeous, the amenities as well were perfect. Thank you, for providing us with a wonderful weekend to our lifetime of memories. “ Beautiful cabin with breath-taking views! The location was very convenient. “ This has been a wonderful vacation staying in the beautiful cabin Heavens Window. We loved the view, and all the amenities the cabin offered. The movie theater room was our favorite, we will definitely be coming back. “ We spent a lovely weekend here celebrating our father's 80th birthday. We've come from Georgia, South Carolina, Utah, and Nebraska. The weather was perfect, and this cabin was gorgeous. We loved the amenities. Thanks for providing a wonderful backdrop to a lifetime of memories. “ Thank You so much for a beautiful, breath taking environment. This cabin was very maintained, cozy, and very accommodating. The view from this cabin was absolutely beautiful, we had younger teens with us who seemed to enjoy their stay as well. “ This was an amazing weekend, we had seven couples with us and had plenty of room. The cabin was awesome and more than we expected, we can't wait to be back !!! “ We had a wonderful weekend in your beautiful house. We had a total of ten people staying here and we were very comfortable. We all loved the movie room, shuffleboard game, and the mountain view. The family really loved the hot tub as well it was a big hit !!! We had family from Atlanta, Chattanooga, and Kentucky, we can't wait to be back. “ This was a wonderful family vacation, the view was amazing !! We loved reading about all the history here, and our children loved every minute of our vacation. “ We had a wonderful time here at Heaven's Window. We appreciate that everything was ready when we arrived. We are also very thankful for the wonderful decorations, such as the Christmas Tree to make us feel comfortable. Thank you so much and we will see you next year. “ Our Family had a wonderful time. We enjoyed the space for all 16 of us, the BBQ grill was used very frequently. We will definitely be back !!! “ We loved everything! The view was amazing! We especially loved the game and theater room. Thank you for letting us stay. “ Our experience here was amazing, it was our first time and lord knows I am looking forward to the next time!!! “ Our family vacation was definitely a great experience. We had family that came in from New Mexico and they loved the stay! The was great. Very spacious, clean, and overall beautiful. The Santos family made memories that would last forever. We to come back and the same or better experience. “ Beautiful cabin, great room for the entire family. The view was great and we walked to Dolly Parton's TN home, the cabin offered so many great amenities.